Aruna Sairam, the Sangita Kalanidhi designate, opens the door and ushers me in with a warm welcome on a languid Sunday morning to her house, named Mantralayam, a neat compact structure nestled inside a street in Abhiramapuram, Chennai. The large picture of Aruna’s favourite Krishna stands tall overlooking the entrance and welcoming the guests. Her love for Krishna began even as a child because of her mother Rajalakshmi Sethuraman who used to organise congregations in their simple flat in Mumbai. The city was a melting pot of cultures, languages and ethnicities. The migrant population was seeking self-expression and preservation of the roots they belonged to. Aruna is a recipient of this rich heritage and culture which her parents zealously guarded and instilled in her brother S.K. Raja and herself, creating an ambience whereby she could learn from numerous masters and shape herself as an artist. According to Raja, Aruna’s strengths are her innate curiosity, her grit and her ability to communicate. 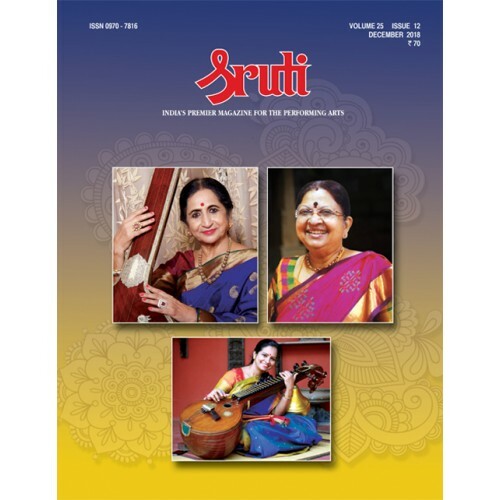 Dr. Premeela Gurumurthy, who recently celebrated the completion of 50 years in the service of music, is a rare blend of a Carnatic and Hindustani musician as well as a Harikatha artist, teacher, scholar and administrator. Premeela was born in a musical family on 5 October 1954 to Amutham and S. Cunjithapatham. Her musical journey began at a very young age and she went on to learn from eminent gurus. She had her arangetram in May 1969 in Colombo which could boast of the Ceylon Prime Minister Dudley Senanayake as the chief guest. Premeela’s first major concert in Chennai was at the Tamil Isai Sangam in 1970. She performed in several sabhas even as she graduated in Music from Queen Mary’s College, Chennai and went on to complete her masters and enrolled for a doctorate to do research in kathakalakshepa. Over the years, Premeela has presented over 400 concerts, musical discourses and lecture demonstrations in India and abroad. She has toured London, Hong Kong, Malaysia, Singapore, Mauritius, the Netherlands, Srilanka, Australia and the U.S.A.
Jayanthi Kumaresh, recipient of this year’s Indira Sivasailam Endowment medal, is an articulate musician who is unafraid of breaking new ground with her music. Not confining the subtle veena to the Carnatic music stage, she has taken it to new and diverse audiences through cross-genre collaborations. To understand her brand of creativity, we only need to listen to her solo album Mysterious Duality. In a relatively short album of original musical content, she explores the potential of her chosen instrument. She superimposes layers of her own spontaneous veena-play around raga-based compositions (created specifically for the album by vocalist Abhishek Raghuram and violinist Kumaresh, her husband). To the familiar strains of the veena in the main and supporting roles, she adds exotic touches like the use of double-bass-like plucking and Western chords to create a rich, harmonious soundscape entirely with the veena. A brief recap: This seems to have become an occasional series, for I take up the thread after a considerable gap. We left the history of the December Music Season sometime in the 1930s, and now here I am talking about the season of 1943. In between, much had happened—the Music Academy had begun presenting dance performances as part of its programmes and this had led to a resurgence of interest in south Indian classical dance. The Indian Fine Arts Society had sprung up as a rival to the Academy and was conducting its conference in parallel, and from 1939 at least, a third group, which espoused the cause of Tamil as a musical language, something that the Academy and the IFAS opposed, had emerged. In terms of venues, the Academy, after peregrinating quite a bit, came to roost at the Sundareswarar Hall, Rasika Ranjani Sabha, Mylapore, with its morning sessions taking place at the prayer hall of the Lady Sivaswami Iyer Girls School, across the street.